For the first time, different industry leaders will be in one roof to empower, connect, inspire and learn from the speakers who will be in the Philippines to share their expertise and experience about the digital landscape in Asia. 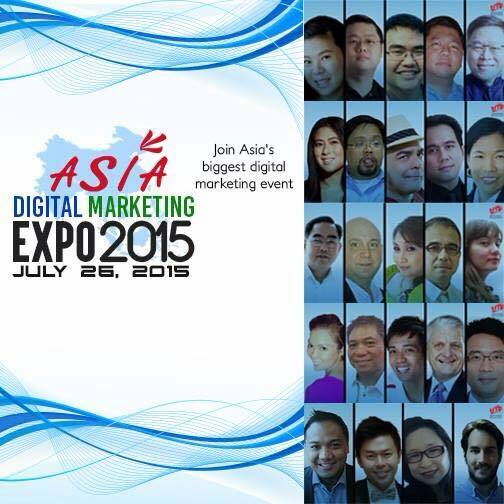 Asia Digital Marketing Expo 2015 will be at SMX Aura, Taguig on July 26, 2015 with a theme: Empower, Connect, Inspire & Learn. Today, The Philippines is the hub of everything; Business Process Outsourcing, Knowledge Process Outsourcing, Network Planning & Optimization, Empowered talents and the Social Media Capital of the World. Filipinos more or less are 100 Million already as of 2014 while 30% are online, 100% are using mobile phones and most of us have two each, no wonder that different companies are putting up their digital marketing department or hiring a lot of online strategist to become competitive and to reach the target market fast. Maria Camille Montejo- CEO, NWSteel Technologies & Tree Top Adventure Inc.
Lewis Hong- Web Digital Marketing Specialist, Xyxon Pte. Ltd.